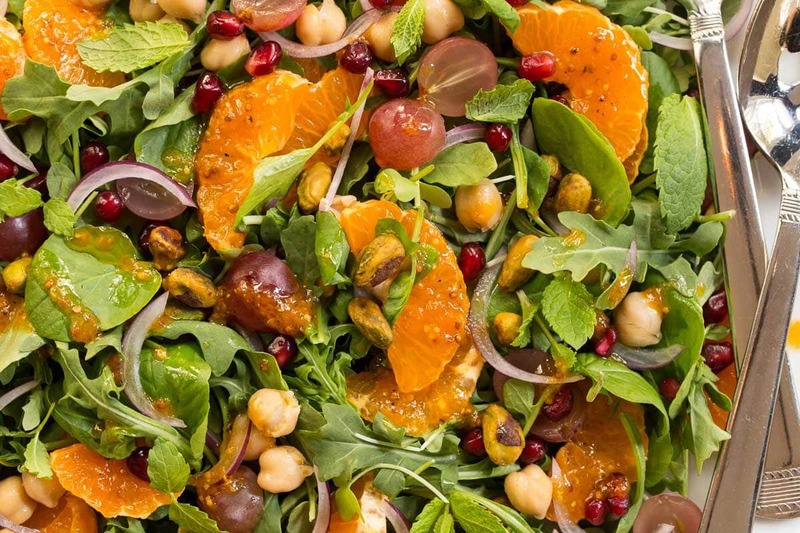 This vibrant fall salad is the perfect way to embrace autumn. It’s with loaded healthy, seasonal ingredients and a fabulous pumpkin dressing. It seems where ever I go, there are new recipe inspirations coming my way. 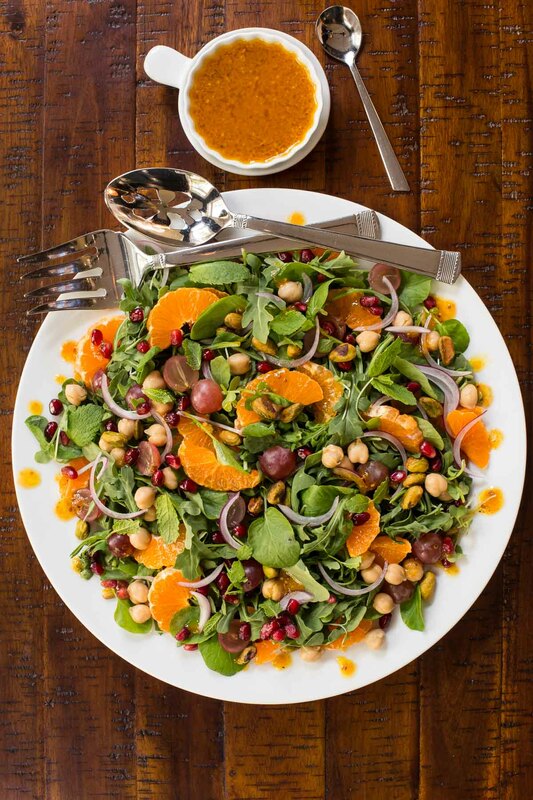 This delicious fall salad was inspired by my daughter, Cait. We had fun hanging out with her family in Memphis last week and, as usual, she served lots of delicious food. One evening it was a healthy dinner with grilled chicken and a beautiful green salad. I loved the whole meal but I couldn’t get enough of the vibrant, flavorful salad. It had baby kale, chickpeas, clementines, red grapes, quinoa, and pistachios. When we got home, I couldn’t wait to make my own version of this fabulous fall salad. And now, I’m happy to share it with you! I decided to use my Maple Pumpkin Vinaigrette to dress my salad. The recipe includes pumpkin puree, apple cider vinegar, Dijon mustard and a drizzle of maple syrup for a touch of sweetness. I keep a jar of this dressing in my fridge all fall long. It’s full of vibrant flavor and gives a nice seasonal touch to salads at this time of year. I think you love having this fall salad in your seasonal arsenal. Serve it as a side or transform it into a delicious, healthy dinner by adding rotisserie chicken, grilled chicken, shrimp or salmon. It makes a lovely lunch or serve it with some warm crusty French bread or this Ridiculously Easy Focaccia Bread for a casual dinner. Use whatever greens you find freshest and prettiest at the market. Cait used baby kale. I used baby arugula and some watercress that was calling my name as I strolled recently, through my local market. Baby spinach would also be delicious as would a nice field green mix. You’ll have more dressing than you need for this fall salad. But no worries! 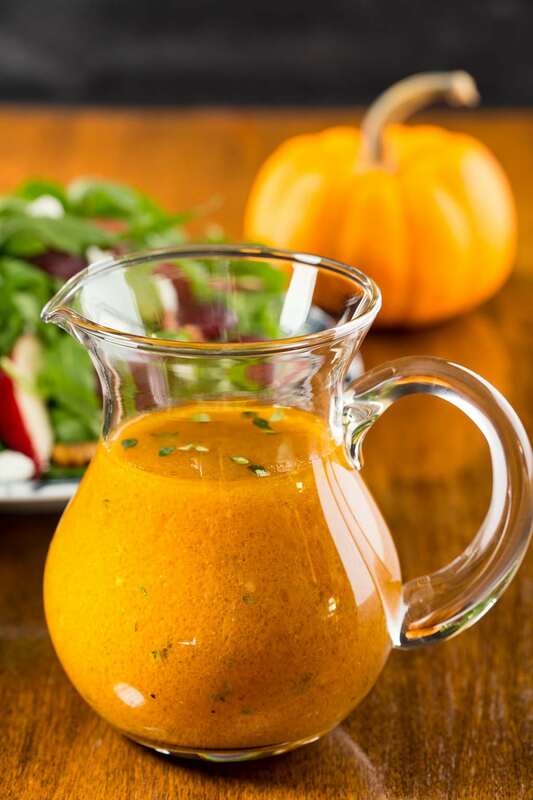 The Pumpkin Vinaigrette is delicious drizzled over any greens and/or fall produce. It’s also wonderful drizzled over chicken, pork and seafood. If you want to make this salad more hearty add a cup of cooked quinoa (here’s a post on how to cook perfect quinoa). You could also use barley, farro or wild rice. Yay, pomegranates are starting to show up at the market! Intimidated by removing the arils from pomegranates? Here’s a step by step tutorial on how to do it with no mess, no fuss, no water! 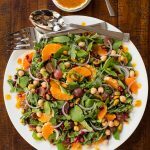 If you’re interested in keeping things fresh and healthy once all the wonderful summer produce has disappeared, check out our Favorite Fall Salads post. There are so… may delicious seasonal ingredients to take advantage of – check out these recipes and you won’t even miss the homegrown tomatoes, sweet corn and summer berries! 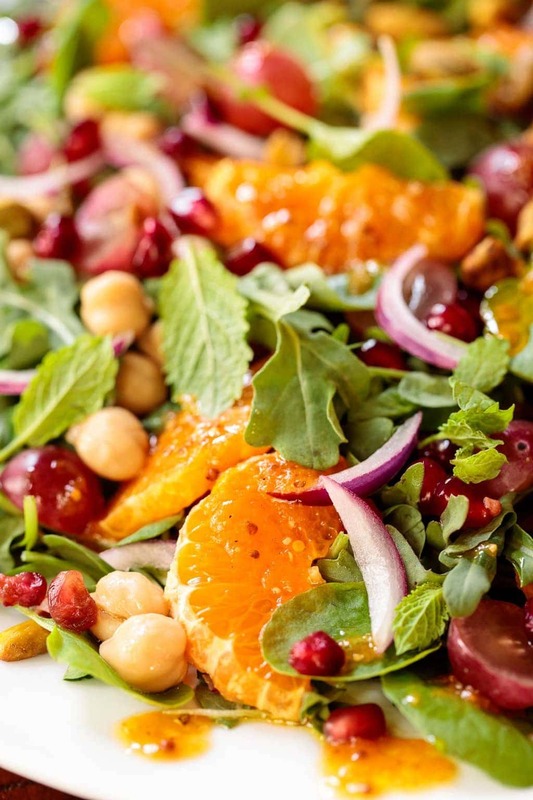 This vibrant fall salad is the perfect way to embrace autumn. It's with loaded healthy, seasonal ingredients and a fabulous pumpkin dressing. Place salad greens and mint (if using) in a medium-size bowl. Drizzle with 2 tablespoons of the Pumpkin Maple Vinaigrette. Toss gently to coat leaves with dressing. Add clementines, red grapes, red onion and chickpeas. Toss again. Turn salad out onto a serving platter and drizzle lightly with more dressing. Top with pomegranate arils and pistachios. Serve extra dressing at the table. The Café Sucre Farine is a participant in the Amazon Affiliate Program. The Amazon Affiliate Program is designed to provide a means for sites to earn advertising fees by advertising and linking to products on Amazon. The price you pay as a consumer does not change. If however, you make a purchase through one of our links, we receive a small commission. And we continue delivering delicious recipes to you! I am in Australia. As mandarines are not in season, I substituted sliced firm (just ripe) mangoes. The result is so delicious. I served this with grilled prawns (shrimps) and scallops on the side. i am inspired by your creativity. What a beautiful salad! And the pumpkin maple vinagrette sounds delicious! What a tasty mix of fall flavors and I’d love to have a few bottles of the vinaigrette on hand. Beautiful. Gorgeous! Your salad is fabulous. I thought the chick peas were hazelnuts, which would be good too! But I really love the vinaigrette. To me, that’s what makes a perfect salad, having a perfect dressing. Thanks so much, Mimi! I’m with you, I love a good salad dressing too! Beautiful salad, Chris! I love all the flavors of fall and this would be a perfect start to a Thanksgiving feast! So much good stuff in this salad! And that vinaigrette is to die for. We could eat this for dinner, but this would also be a great starter for a dinner party. Terrific recipe — thanks. I love these flavors, what a gorgeous autumn salad! So beautiful! So much colour and flavour going on and a perfect side for a simple protein. Will be making this! This is gorgeous, Chris! I’m stuck in a salad rut and need to break out. 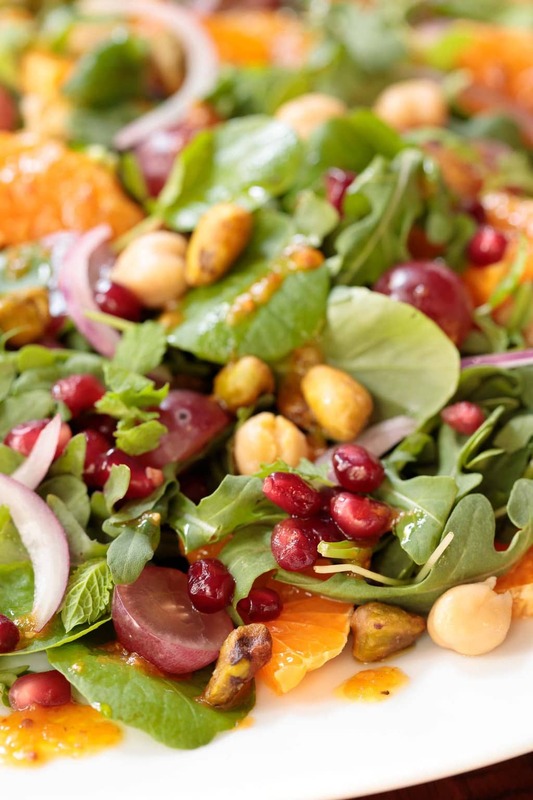 You’ve inspired with this this delicious autumnal salad! What a gorgeous fall salad Chris! That pumpkin maple vinaigrette is pushing all my buttons! It sounds delicious. A pumpkin vinaigrette is such a wonderful idea, I love your creativity Chris, I’m definitely going to try this! Such a lovely Fall salad! And that maple vinaigrette sounds just as marvelous 🙂 Thanks for sharing, Chris.